Come along as one of Suburban's Private Detectives takes you on a surveillance investigation! Free Sample from #Nationwide Police Strike, Download it Today! Who protects the defenseless when the nation's police officers go on strike? The current climate in the law enforcement community is dismal. With the advent of the black lives matter “movement”, police officers must constantly remind themselves why they took this job. Why do we sacrifice so much for people who care so little. It’s amazing that only fifteen years after 9/11 cops went from heroes to criminals. The purpose of this concise ebook is to offer a touch of sanity. My intention is not to debate the legitimacy of black lives matter or any other group that claims civil rights violations. I’ll leave that debate to the pundits who love to hear themselves talk. The following is an editorial. It includes theory, opinion and a brief history as seen through the eyes of a full time law enforcement officer. One that is disgusted that many people in society does not recognize how fragile the thin blue line really is. I felt it necessary to include in the "anti-police" discussion facts that the main stream media will not address. This ebook is in no way advocating that police officers should walk off the job, or even have any legal right to strike. My purpose is to put into perspective the totality of the situation and not only what the mainstream media wants the public to hear. The night before I started this project I watched the local news where a black woman (and black lives matter protester) stated her fear of the police was keeping her awake at night. She said what concerned her was that she didn’t know whether a family member of hers would be killed tonight at the hands of police. Huh? (yeah, I’ll let that sink in for a minute). Society burdens police with protect strangers for a paltry paycheck and now they need to worry about her feelings? Let me tell you something, I’m gonna sleep just fine at night knowing that her greatest concern in life is not only improbable but highly unlikely. I assure you she has a better chance of getting struck by lightning while running to the store with her winning lottery ticket than a family member being hurt by the police. In fact, the likelihood of her family coming in contact with the police are nil, and most likely that brief interaction is because he held the door for her at Dunkin’ Donuts. We now need to be so Goddamn concerned with your feelings, how about ours? When are our feelings considered? We get spit at, kicked, yelled at everyday for something as simple as writing a parking ticket, and nobody cares. Now, criminals all over the country target with aspirations to kill us. Even though yesterday's spring snow storm was unexpected but Suburban Security was ready. 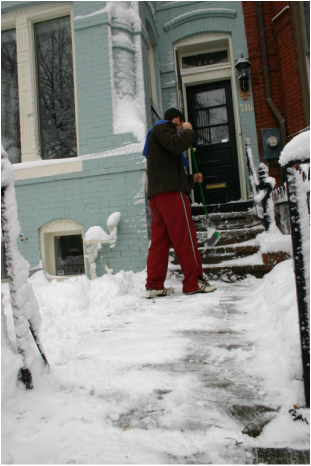 With snow brush in hand our security guards gave the illusion that our customer was home. Using the patrol vehicle to make tire marks in the driveway and then brushing off the client’s car that was buried in snow throws potential burglars off their game. “Are they home? I’m not sure…” This is the philosophy Suburban subscribes to during any season and during any situation. This customer had no idea Massachusetts would receive five inches of snow, but is now thanking us up and down for not only checking his home but going the extra mile! "It's all in a days work for Suburban's finest" I replied. So call today for home protection that fits Suburban needs! Stun Guns Legal in Massachusetts? For as long as I have been a law enforcement officer, Massachusetts has banned several “per se” weapons claiming them to be too dangerous to possess. These weapons include stilettos, dirk knives, brass knuckles and of course electrical weapons (a.k.a: sun guns). Under Mass general law chapter 140 section 131J one could not possess or sell an electric weapon and the penalty could be up to two and a half years in jail. But a recent United Sates Supreme Court decision says the Massachusetts law is unconstitutional! Thus, a law that police have been enforcing for decades is now nullified and police departments across the state are educating their officers to NOT arrest for this crime. According to a www.thetruthaboutguns.com article posted on March 21, 2016: The case at bar, Jamie Caetano v. Massachusetts involved a defendant — a 4’11” woman residing in the Commonwealth of Massachusetts — who had been given a stun gun by a friend for the purposes of protecting herself against an abusive ex-paramour, who was also the father of her two children. Caetano had allegedly been beaten previously by her ex so severely as to require medical attention. This Supreme Court decision has dramatic implications in the area of self-protection and self-preservation. This means that one could make the argument that all types of weapons that are currently banned for being a per se weapon could be legalized under this decision. Thus, stilettos, dirk knives and even “brass knuckles” could be argued that they’re possessed for the purpose of protecting themselves. I recently received an email from a credit card company of whom I do business. I read the email twice and thought, 'would my credit card company really attempt to contact me using email? I don't think so.' Being the suspicious, skeptical person that I am, I called the credit card company using the phone number that is printed on the back of my card. And low and behold, my credit card company doesn't even have my email address on file. Imagine that? The service rep I spoke with said it happens so frequently now that the company doesn't even investigate these claims anymore. So, I thought I would research and share some helpful hints to protect us from becoming victims. Never respond to an unsolicited email that asks for detailed financial information: (In my case I did not click on the link but if I had I'm sure it would've sent me to a site that asked for my log-in, password, account number, date of birth or other identifying information. I've heard of other incidents where clicking the link taked you to a site and asks just your username and password. When you enter it the next screen read something like, "I'm sorry but our system is down, try again later". Then you go about your day not knowing that your username and password were recorded and your account is being cleaned out). Report anything suspicious to the proper authorities: (If after you believed you were scammed, or your account has been hacked, you should always report it to your local police department. As long as there is a monetary loss, or potential for loss, your police department is obligated to document the information and conduct an investigation. Most local departments are involved with state reporting agencies who track these types of cyber crimes. Even though most of these phishing scams are done across country lines, financial institutions are much more ready to assist you AFTER you've reported it to a law enforcement agency. In addition, you can put a fraud alert on your credit report by contacting all of the major credit bureaus: Equifax, Experian and Trans Union). Contact the Internet Crime Complaint Center: This agency is a partnership between the FBI and the National White Collar Crime Center and can be reached at www.ic3.gov. I hope these tips help and feel free to contact Suburban Security for a free consultation or for more information. Please review the below PDF courtesy of the Internet Crime Complaint Center. Thank You! Some of these mischief makers find it fun to express their artistic side by spay painting your wall with some nonsense. These mini Van Gogh's cause hundreds even thousands of dollars of damage for each incident. So, as a property owner how do you protect your property? There's two proven ways to accomplish this: First, hire Suburban Patrol to conduct random physical security patrols of your property to detect and deter trespassers and give the illusion of constant supervision of the property. For a flat daily rate Security Officers will patrol your property on foot and vehicle, find trouble-seeking youth and advise them they need to relocate themselves. Most youths are not really looking for trouble and just need to be reminded that your property is not a hang out! In addition, Officers will observe and identify those man made issues that require immediate attention. The second way to prevent trespassers is to install motion activated lighting around the property. These don't have to be ultra expensive and you do not need an electrician to install them. New, condensed units can be found at your local hardware store and installed into any incondescent lightbulb socket. You can even purchase ones that illuminate when the sun goes down. Most "taggers" require the cover of darkness to commit their crime, so take that element away! And always, call Suburban for a free consultation and home security evaluation. Also, visit suburbanpatrol.com for more info! Attorneys: How Honest Are Your Jurors? As a licensed private investigator I receive calls from prospective clients who need personal situations investigated. It's always interesting to hear some of the questions people have about what I can and can not find out. As always, I'm as truthful as possible and explain that I've never looked for this or that, but know another investigator who would be able to find what they're looking for. Oftentimes there is an awkward pause on the phone as I'm staring off into space thinking about their question and this type of investigation. But this got me thinking, how does a prospective client determine that I'm the private investigator to hire? Is it just I'm willing to help or even make the effort to listen, or is there something more? Hiring a PI is not as easy as one might think. Consider this: If you were hiring a contractor or painter for your home the first thing you'd ask for is pictures of recent work; or if you were hiring a nanny or daycare you'd ask for references. Unfortunately, in the PI business we are very protective of our clients’ information and our classified information is just that: classified! So, I decided to make a post with the three of the things I think are important when hiring a private detective. Number 1: License: This one is obvious, but the first thing you need to look for is licensing. The Private Detective business is highly scrutinized, especially in Massachusetts. The licensing agency is the Mass State Police and there is nothing cops hate worse than people pretending to be cops. So they have very strict requirements and procedures that one must follow or their license is in jeopardy. In addition, the special licensing division of the Mass State Police keep good records of complaints and/or subsequent suspensions or non-renewals. Most licensed PI's welcome this kind of scrutiny because it keeps investigators honest and keeps those wannabe PI's from taking advantage of someone who just needs help. If there is even a question of a Detective license status call the Mass State Police Special Licensing Certification Unit in Davers at: (508) 978-6127. Number 2: Initial Conversation: One thing that irrates me to no end, (and this goes for any profession) is someone who takes work that they're not qualified for or has no training for this type of work. We call this the Starving Artist syndrome: they need the work so bad they say yes to anything. So, during the initial conversation does the investigator "yes" you to death? Are you asking them to do something that may be inappropriate or even criminal and their response is 'oh, yeah we can do that'. Or, are they asking you questions in return? This person is supposed to be a professional investigator and a red flag should go up when he asks you no follow-up questions. I cant tell you how many times I've been asked to locate someone and after my series of questions, (that include their relationship with the person, any restraining orders, and of course WHY they want to find this person), I told them sorry, that's not something I can do. And, how can I go without talking about the people that try to lie to me: 'I don't know if she got a restraining order against me..." Sorry Buddy. So, if the investigator's only response is “yes,yes,yes...what's your credit card number?” you need to look elsewhere. Number 3: Specialization: Does this investigator or company specialize in the type of investigation you're requesting? Several years ago the PI landscape was covered in so-called Generalists who would conduct any type of investigation under the sun. One day their following a cheating partner the next they're conducting a corporate investigation of an employee stealing company funds. Even though these types of agencies still exist, (and are more than capable), investigators today are specializing in certain types of investigation. Several of my colleagues only conduct cheating spouse and domestic investigations, and make a very good living at it. However, even though I have a lot of experience in this type of investigation I do not specialize in it. My humble opinion is that a specialist conducts their type of investigation day in and day out, and her brain is constantly trained on its approach, sequence and conclusion and that experience is invaluable. I hope these tips help you in your search for the perfect Private Investigator. And, don't forget to listen to your gut feeling. Like anything else you need to like the investigator because you’re going to trust her with some very sensitive information. Please feel free to contact me with any questions about private investigations or how to find a detective. I have many friends in the business and if I don't specialize in the investigation you need, I'll put you in contact with one who does. Please contact me through my website SuburbanPatrol.com and good luck! With all the recent snow in New England it's easy to determine which homes are occupied and which are vacant. My neighborhood has several so-called "snow birds" who have duel residences. In the summer they're in Mass and the winter they live in Florida. Oftentimes, these lucky people do not have their driveways plowed or their walkways shoveled; and why would they? Plow companies are expensive and since the home is not occupied they're paying for an unnecessary service. Enter the criminal: these dirt-bags look for a home with the driveway not plowed or walkway not shoveled and target it. What's ingenious is its not uncommon for these low life's to bring a shovel with them and pretend that they're doing a good deed: this eliminates suspicion. Neighbors and people passing by would think its a family member or hired hand shoveling the property. What they don't know is that after about five minutes of pretend work, the dirt-bag goes to the back of the house and bam! makes his entry. It's only weeks or months later when the homeowner comes home to find their valuables gone! This Blog is written by Suburban's security experts, based upon their on-the-job experiences and professional training. Nothing in these posts should be considered binding between the reader and Suburban's security team nor should it be considered legal advice. Just fun tips to help "Protect Your Most Valuable asset".